India leapfrogged both the US and Brazil to become the nation that downloaded the most apps from Google's Play Store, according to analytics firm App Annie. 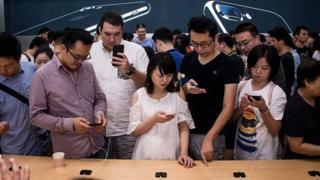 It also claimed that China became the biggest source of revenue for Apple's iOS App Store for the first time. However, the BBC understands that Apple's own figures contradict this. They suggest China still lagged behind the US and Japan last year. The tech firm has, however, not commented on the 2016 Retrospective report. A spokeswoman for Google also declined to comment. Google and Apple both take a cut of software sales and in-app fees from third-parties that publish on their respective platforms. Their differing successes are explained by the fact that Google Play does not operate in China, while iPhones have a much smaller share of the Indian market than they do in most other countries. San Francisco-based App Annie's research is widely used by app publishers and others involved in the digital industries. "We are always confident with the data we release in our reports, attributing the estimates to a veritable degree to accuracy," a spokeswoman said. In total, it said more than 90 billion apps were downloaded via the two stores over the year. The popularity of Google Play downloads in India is linked to the fact that the nation became the world's second largest smartphone market in 2016, according to the United Nations, based on the number of people with mobile data subscriptions. Only China has more users, but because of local restrictions they mostly download Android apps from marketplaces run by local tech firms such as Baidu, Tencent and Huawei. The report indicates more than six billion apps were downloaded in India from Google Play over the 12 months, allowing the nation to narrowly beat the US's tally. "An Indian smartphone user has more shopping apps on their phone than a UK user," App Annie's Paul Barnes told the BBC. "Social and messaging apps have [also] been exceptionally popular - WhatsApp in particular is one of the most widely used apps in the country. "This has created a fairly unique app market in India, where gaming is slightly less dominant than we've seen in other emerging markets, such as China." Mr Barnes added that India was likely to maintain its Play Store lead for some time to come and could top 20 billion downloads by 2020. "I think if you look at the fact that smartphone penetration is still only 30% in India, then we expect to see that growth in downloads accelerate." App Annie's claim that China had overtaken the US as the biggest revenue source for the iOS App Store was based in part by its success in the final three months of the year. More than $2bn (£1.7bn) was spent locally in the last quarter, the report said, which compared to about $1.5bn (£1.2bn) in the US for the same period. "There's been a real surge in 2016, which has been something of a surprise," Mr Barnes acknowledged. "With China, local games are particularly popular. The companies NetEase and Tencent have done incredibly well." The report highlighted the Fantasy Westward Journey series - role-playing titles based on a 15-year-old PC game - as being particularly successful. They have generated more than $800m (£664m) for NetEase in China since it released the first title in March 2015. The report added that Tencent's QQ social network also made substantial gains in 2016. Its games are free to play, but the firm sells weapons and other virtual goods within them, as well as making money from adverts. App Annie acknowledged that Japanese iPhone owners still spent more on average than any other nationality. But Mr Barnes said Chinese users were catching up quickly. "China has actually increased per person spending on games 10 times since 2014," he said. In total, Apple and Google's app stores generated $35bn (£29bn) in revenue in 2016, according to the report, representing a 40% gain on 2015.